Use composite and fiberglass covers as a smart alternative to steel plates. The composite trench cover is far lighter than steel making them easier to maneuver. You will save money on heavy lifting machinery as all our covers are a 1 or 2 person lift. Save time on installation. Our composite trench covers and road plates are anti-slide and can be bolted into place. No cold patch necessary! 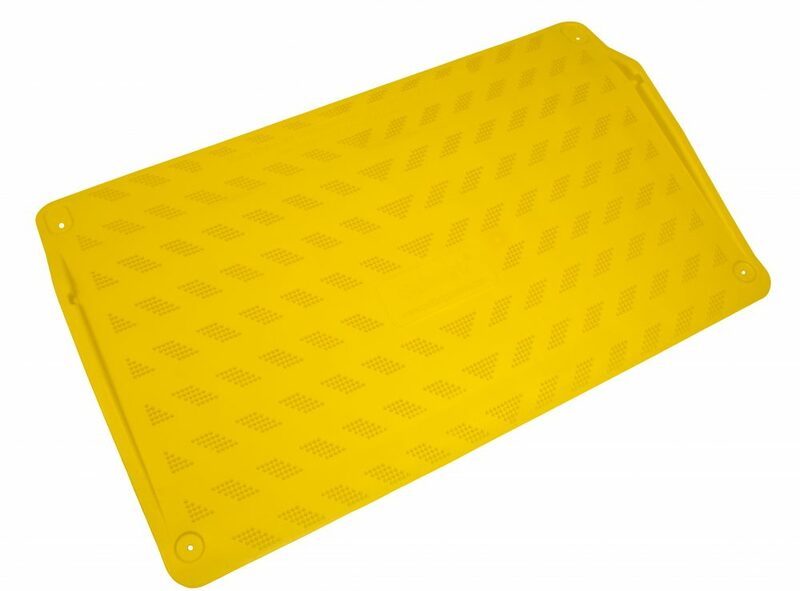 Our road plates are HS20-44 compliant. Heavy goods vehicles can safely drive over it in the roadway. 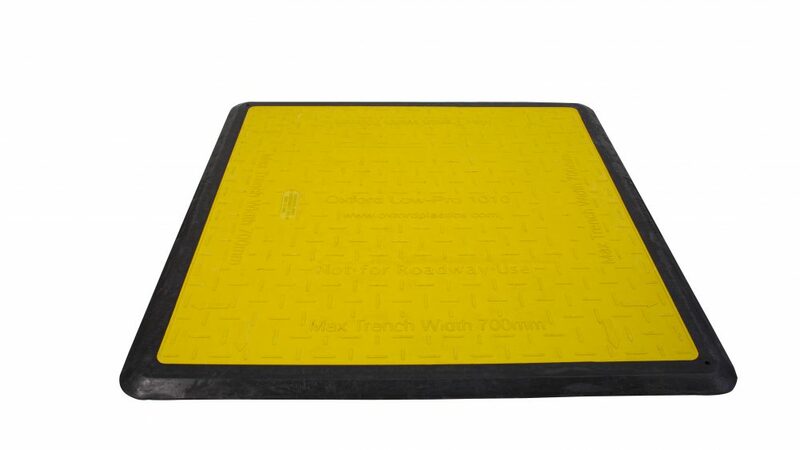 LowPro 23/05 Road Plates and LowPro 15/05 Road Plates are the Oxford Plastics composite trench covers, with sizes for different applications. Oxford Road Plates are modular and each piece is installed manually with a 2 person lift, unlike with steel road plate installation which requires expensive heavy lifting equipment. Keep your crew safe and the public safe by using composite road plates rather than steel road plates. Oxford’s LowPro Road Plate won’t slide out of place due to the lateral lock drop pins & Flexi-Edges that grip the asphalt. Bolt into place for maximum stability and safety. We know that noise complaints are a major problem when using steel plates. Avoid the noisy soundtrack by using composite road plates! 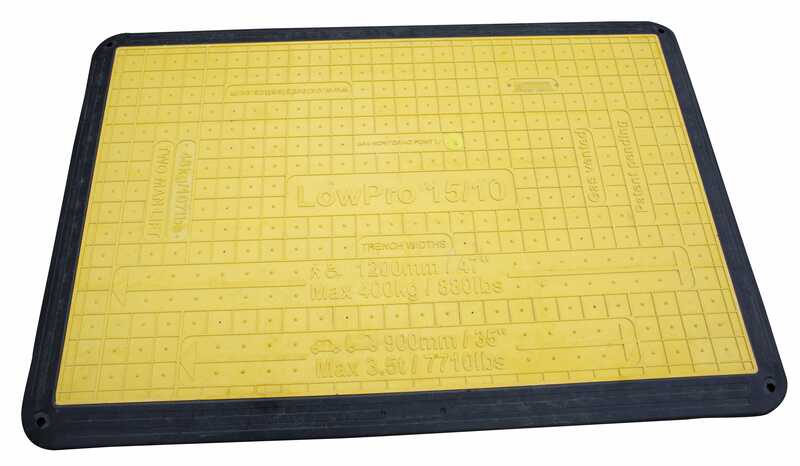 The LowPro road plates feature noise-reducing rubber edges that absorb sound and reduce movement. No more calls about noisy steel plates! The LowPro 15/10 is designed to allow access on driveways, where vehicles are up to 3.5 tons. This composite trench cover is commonly used in residential areas as an alternative to noisy steel plates. Made from HDPE, this cover is far lighter than steel trench covers and can be manually installed quickly with 2 people. The rubber-like edges grip the asphalt to prevent it from moving when driven over and also absorb sound. The LowPro 11/11 and LowPro 12/8 sidewalk covers are designed for foot traffic and pedestrian areas. 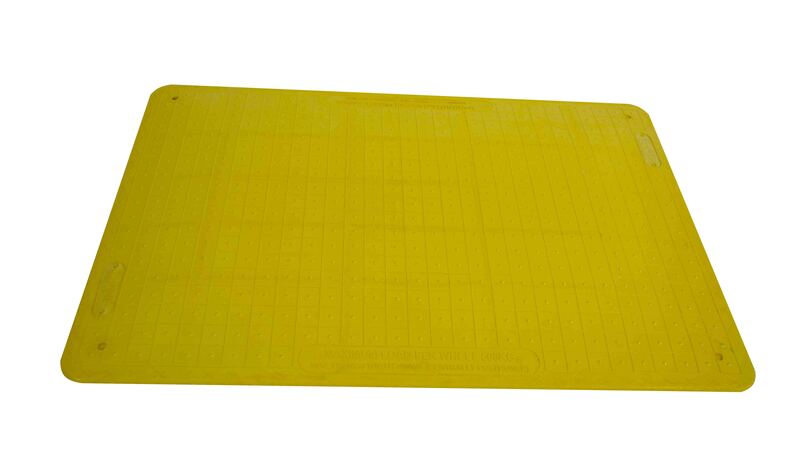 The surface is hi-vis yellow and anti-slip, while the beveled edges reduce trip-hazards. It is commonly used as a temporary manhole cover. Made from HDPE, the sidewalk trench cover range is far lighter than steel covers and is easy to install with 1 person. The LowPro 11/11 and LowPro 12/8 are ideal for utility works, utility repairs and ground excavations. No need for cold patch, just place it over the trench! 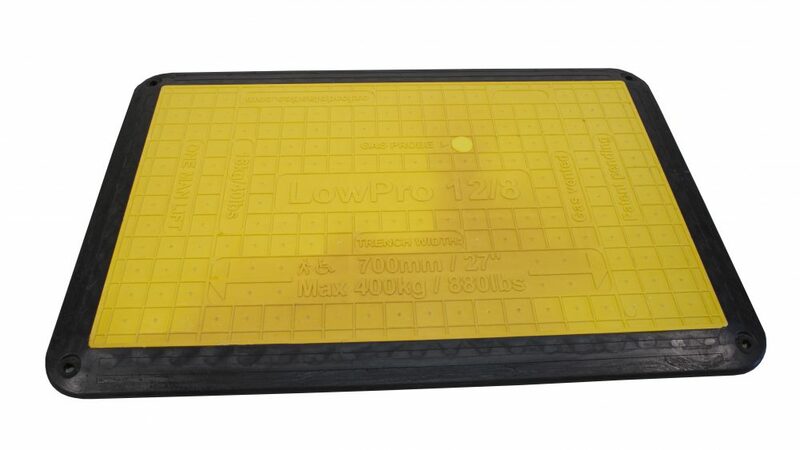 The LowPro boards have a black rubber-like border made of patented Flexi-Edge which secures it to the asphalt. LowPro boards are anti-slide which means they do not need to be bolted down. They come with bolt holes so that they can be attached if the risk assessment deems necessary. These sidewalk wheelchair ramps are often used by Public Works departments and contractors in urban areas during utility and street work repairs. Both the SupaGrip and SafeKerb are portable ramps that can be installed rapidly. The SupaGrip is our 2nd generation curb ramp. The black rubber Flexi-Edge grips the asphalt and curb eliminating the need for anchoring. However, bolt holes are built in for added anchoring, if maximum stability is warranted. 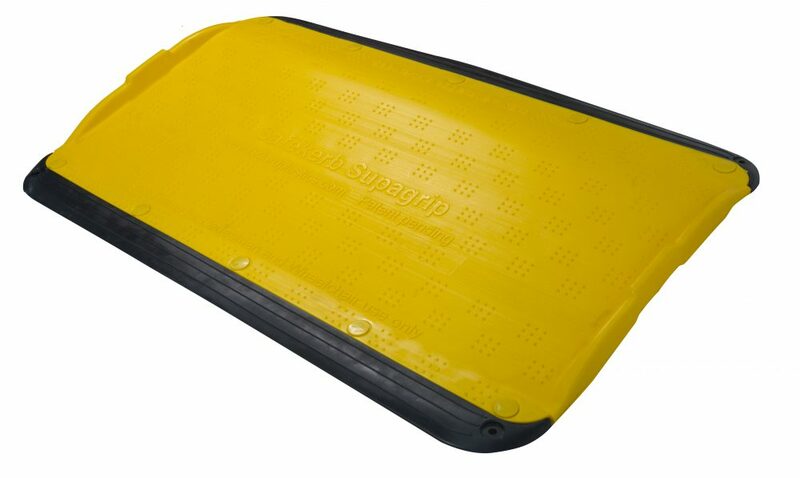 These yellow hi-vis curb ramps are easy to see and simple to use, providing more site safety.